Scrangie: Zoya "Get Your Green On" Promo SOLD OUT! EDIT: Whoa, you guys were fast! 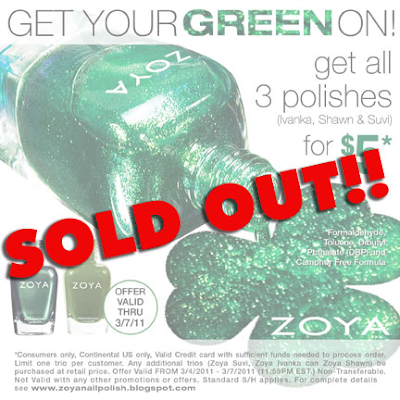 Zoya is completely sold out of greens! Sadly, since they no longer have the inventory to fill any more orders, the promo has ended early. Green nail polish is in! We want you to get your green on! Get 3 of Zoya's best selling green nail polishes for $5*! This incredible offer includes Zoya Suvi, Zoya Shawn and Zoya Ivanka! Green polishes for work, play and everyday! Get this $24 value for $5* when you add it to your cart now! (You save $19!) Don’t miss out! This offer is only valid until March 7, 2011 at 11:59 EST! Limit one Trio per customer. Add one "Get Your Green on Trio" to your shopping cart. Once in your cart a discount for $19.00 will appear, reducing the net Trio cost to $5.00. Then just complete the checkout process. Remember only one "Get Your Green on Trio" will be discounted. Any additional trios that you purchase will be at regular price. CLICK HERE TO TAKE ADVANTAGE OF THE OFFER RIGHT NOW! (*Consumers Only, Continental USA only, Valid Credit card with sufficient funds needed to process order, Limit one per customer. Any additional trios (Zoya Suvi, Zoya Ivanka can Zoya Shawn) be purchased at retail price. Valid ONLY FROM 3/4/2011 - 3/7/2011 at 11:59PM EST. Non-Transferable. Not Valid with any other promotions or offers. Standard S/H applies. For complete details see www.zoyanailpolish.blogspot.com. I wish they'd ship this to Canada, I'd buy it. Zoya really pisses me off. They don't ship to Canada, none of their offers are available in Canada, etc. etc. We are like, 2 feet away from the US and our dollar is on par. There's no reason not to sell to us. Just ordered mine, plus Gemma. This means I'll have 3 Suvis, but I'll either franken it or give it away. Oh wow! These are stunning! I would be all over this over if it weren't for the fact that I live in the UK. Boo! CURSE MY AUSTRALIAN ROOTS!! Why tempt me with things I cannot have, Scrangie? WHY?? 11 am and it's already gone!? Nooooo!! Glad I already have those three! PHEW!!! I'm glad I grabbed mine early! I ordered mine last night - good thing I didn't wait! Wow! I thought it'd last the whole time, good thing I decided "to heck with it" and ordered it last night!!! I'm so glad I got my order in this morning. I can't wait to get it! I believe the reason they can't ship out of the US is because of the restrictions with their shipping method. If you know someone in the US, you could always have it shipped to them or have them order it for you and ship to you. Just a suggestion. Unfortunately, I don't have any friends in the US. And I don't see what shipping method they could use that would be disallowed in Canada; I get nail polish from the US all the time. It definitely fosters a feeling of ill-will towards the company. I got my order in...I had been sitting on an order to go to Zoya anyway. Soon as I saw your new blog go up, I went and placed my order...even paid the extra $2 for upgraded faster shipping! Cannot wait. I am so glad you posted it. I also got Gemma - in fact the entire spring collection and a 4 others. I'll have plenty of choices for St. Patty's day now! I bit ticked at Zoya right now. I realized the night after I ordered my 3 green polishes, plus Gemma, that I had an $8 Spoon Credit. So I thought "oh cool, I'll get Gemma for free". So I waited and called them this morning and they can't do it. "The system" only excepts one promotion at a time. It's not a promotion, it's a credit and it's not going to pay for the promotional stuff I'm buying. Not very customer friendly. this is a great color. i would hve surely ordered one but its gone sadly. Auroragyps - don't be too upset with Zoya. Most all retail companies operations are exactly the same. It even pre-dates internet shopping when the coupon clippings said clearly, cannot be comboed with any other offer. But in defense of Zoya and most all on line retailers, it's the computer programmers that limit the possible input into the system. Credit vs. promo - only one line to put a code in per the way it was programmed, that's just how it is. Still you got 3 great green polishes for $5! And Gemma is worth paying full price for. Just look at the positive side that next order you have your spoon credit. It WILL come in handy when you NEED something now and there is no promo on at all. Thanks for the post on this! I got in early and ordered a set and they arrived yesterday. A great opportunity to explore greens, they are all gorgeous! I just got my trio, and I was sent Envy in place of Shawn. Anyone else have this experience? beachgal- I don't think I'd have been upset if they didn't call the spoon credits a "credit". I wouldn't try to combine two separate promotions, but I thought the spoon credit would be different. If they had had a coupon code for this deal, then I wouldn't have even thought of using any other code, because that box would have already been filled. The thing is, I don't order form Zoya unless they're having a deal on something. That's how I got the spoon credit too begin with, with their Get $3 of Color Spoons for Free Deal, and I got $5 extra thinking I'd get a 'free' polish sometime. With their policy, I don't think I'll ever get to use my spoon credit. I'm on too tight a budget to order things when they're not on sale or a good deal, and those are the times I save up to treat myself to something nice or special. As much as I'm still a bit mad at Zoya right now, I think I'm more disappointed. Victoria- Just got my polishes and I got Envy (which I have) instead of Shawn too. I already had Suvi, but figured wth, I'll have another dupe, but I'll also get a deal on 2 new polishes. Hope I don't have a problem exchanging Envy for Shawn. They also might have forgotten my bottle of Gemma. It's on the order form, but not in the package. However, I have all my stuff shipped to my parent's house, because where I live is iffy. My mom checked out what I got (I always show her what I buy) and might have forgotten to put Gemma back in. I'm hoping that's the case and I'll find out once she gets back home.